I’ve noticed something interesting. While serious thinkers are likening what John Kerry and Barack Obama did vis a vis Iran to Neville Chamberlain’s disastrous Munich Agreement, they’re not using the world “appeasement” as the dominant trope. (E.g., Charles Krauthammer and Bret Stephens.) They’re just saying that, in terms of giving a tyranny permission to be tyrannical, Obama and Kerry have followed in Chamberlain’s footsteps. Here, however, as Stephens again points out, America held the hand with three kings. Right up until Obama signed on the dotted line, Iran was a pariah nation badly hurt by economic sanctions, while America still has the most powerful military in the world. 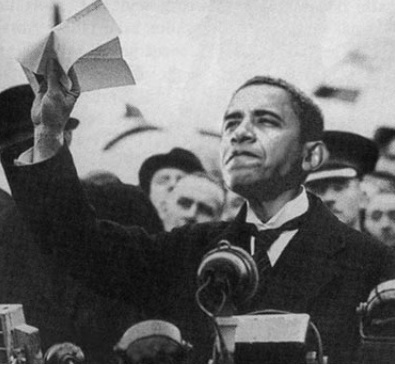 Thanks to Obama, though, Iran has been given permission to go ahead with all the enrichment it needs to do to position itself for becoming a nuclear power; it’s been relieved of an enormous economic burden; and it’s been legitimized — and all when we had the winning hand. So yes, this is much worse than Munich. Obama isn’t trying to make the best of a bad situation; he is intentionally creating a bad situation because that situation harmonizes with his core beliefs and values. And if that doesn’t scare you, nothing will. UPDATE: Lee Smith states it simply: Obama has had America switch sides. Iran is no longer our enemy, but our ally. We once supported a liberal democracy, but we now side with a bloody-minded, genocidal, misogynistic, homophobic, totalitarian Islamic dictatorship. Obama has soiled America. Hat tip to Jon Gabriel for that great photoshop.